Thomson Delmar 2006, ISBN 1-58450-850-7, 365 pages. The text includes the SystemVue Textbook Edition application software from Agilent Technologies EESof EDA (link) and the simulation models described in the text. This is a special application of the SystemVue Professional communication system simulator that, although somewhat restrictive, can execute the simulation models in the text. The Description and Table of Contents (pdf) for the text are available here. The SystemVue Textbook Edition does not allow the addition or deletion of the model tokens or the connection between tokens. Only the digital communication system models described in the text can be accessed and executed. The text is a direct outgrowth of experience in teaching analog and digital communication systems at the undergraduate, professional, and graduate level. The sea change in this material for the undergraduate and professional student is the introduction of channel noise and non-linearities in the analysis of communication systems within the last decade. Prior to this time, analog and digital communication systems were presented by analytical equations without noise, and with a hardware laboratory without significant non-linearities. Chapter 1 The SystemVue simulation models in the text support Communication Simulation Techniques, which is an introduction to the simulation environment and the libraries and tokens. As a quick-start to the simulation environment, AM and FM analog communication systems are modeled in SystemVue. Chapter 2 The SystemVue simulation models in the text support Baseband Modulation and Demodulation. SystemVue simulation models are provided for rectangular, sinc, raised cosine, and multilevel pulse amplitude modulation. The optimum correlation receiver for baseband signals, partial response signaling, and delta modulation are also modeled in SystemVue. Chapter 3 The SystemVue simulation models in the text support Bandpass Modulation and Demodulation. SystemVue simulation models are provided for binary and multilevel amplitude, frequency, and phase shift keying. The optimum correlation receiver for bandpass signals, quadrature amplitude modulation, and differential phase shift keying are also modeled in SystemVue. Chapter 4 The SystemVue simulation models in the text support Synchronization and Equalization. Techniques for carrier frequency, carrier phase, and symbol synchronization are modeled in SystemVue. SystemVue simulation models are provided for channel equalization and channel models. Chapter 5 The SystemVue simulation models in the text support Multiplexing. SystemVue simulation models are provided for time, frequency, and code division multiplexing. Techniques for direct sequence and frequency hopping spread spectrum, and orthogonal frequency division multiplexing are modeled in SystemVue. Chapter 6 The SystemVue simulation models in the text support Sampling and Quantization. SystemVue simulation models are provided for sampling baseband and bandpass analog signals, companding, and pulse code modulation. As an engineering student, I have been exposed to a number of different textbooks on this subject, all with varying degrees of value. This book easily rises to the top of the pack. I will explain why. Many books attempt to discuss the topic of electrical communication schemes through blunt mathematical rigor. Such an analysis may benefit the mathematically inclined, but leaves the rest of the students wanting. This book, however, is packaged with the excellent SystemVue software, a powerful software package that is used in industry to design actual communication systems. By utilizing the simulation software, in addition to providing a large number of images (graphs, constellation plots, output waveforms, etc), readers are given a visualization of the complex topics discussed in the text. I think that it is incredibly valuable to be able to visualize the concepts being discussed, and I also think it is important to see how a physically-realizable system can come to certain results. The differing effects of BFSK and QPSK for instance, may be difficult to understand in a purely mathematical context, but by viewing the output waveforms, and spectrums comparatively, the user is able to quickly discern the differences between the two schemes. The only qualm I would have about this book is that the version of SystemVue that comes with the book is a heavily watered down version, and is only capable of simulating the examples from the book (the user cannot use the software to create a new simulation). However, when you consider the sheer price of the SystemVue software suite, it is amazing that the book's author was able to include any version at all. I highly recommend this book to anybody who is new to the subject of communication systems, and even people who have had classes on the subject, but want to see the material presented in a more visual way. Because of the relative inexpensiveness of this book, It makes an excellent counterpart to other textbooks that are more steeped in the mathematically rigorous derivations. 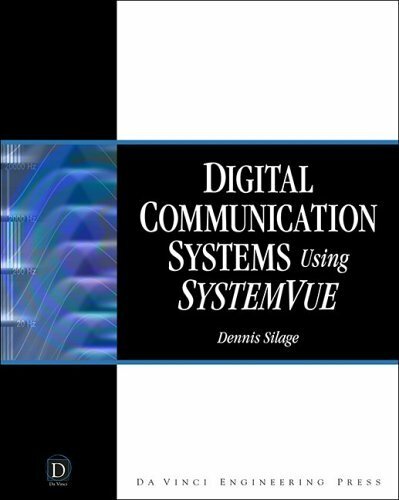 Dennis Silage's DIGITAL COMMUNICATION SYSTEMS USING SYSTEMVUE would be a fine college text with its comprehensive survey of the Agilent SystemVue simulation environment. Advanced users of the communications simulator will find here plenty of analysis and insights on DSP processors and applications, offering pros and advanced digital communications users an introduction to the SystemVue environment using plenty of examples and results.